Today’s competitive world calls for employee satisfaction, quality infrastructure and efficient management from all enterprises, however big or small. These are some of the significant prerequisite that allows a company to compete with its rivals and stand out and the situation of facility management in India is no exception to this. The market comprising of facility management in India has a direct and potential correlation with the growth of the construction sector. This sector, involving everything from real estate to infrastructure projects have is witnessing a resilient growth. The present effective business of outsourced facility management was around US $825 million in the last decade. Though the facility management business of India is in its developing stage compared to the first world countries around the globe, its growth is seen in almost all sectors. The huge scale of the various markets in India along with vast resource of geographical area are the primary contributors of revenues of the facility management. But when it comes to the comprehension of market, its maturity and acceptance of the available services by the users, India still has to go a long way. The facility managers have always focused on offering soft services and therefore, they are looking forward to adding specialized technical services within the portfolio of their services. Considering the mature markets across the globe, the attention of the facility managers shifts on maintenance, building control system, integrating facility through maintenance services and building operations. The provision of services in the US markets and Western Europe are more prone to providing the clients with advanced technologies meant for enhancing the quality of services. Considering the situation in India the services offered are quite substandard with fundamental mechanical maintenance of security, generator sets, plumbing, housekeeping, landscaping and many others. Contrary to other developed countries around the globe, technology is still waiting to cast a positive influence on Indian facility management market. The best practices of facility management should contrive to reduce the overall operational cost of the business establishment, improving client’s experience with the services and increasing the longevity of the various assets and liabilities of the business. All these factors further pose a threat to the ability of the facility managers to provide customized solutions within the stipulated time frame without compromising the quality of services. For instance, considering the situation in any developed market, facility management is considered an integral part of business operations and maintaining relationship with the consumers at all stages. Facility managers in most countries work in close coalesce with the customer relationship management or CRM software which are designed and offered by notable IT concerns. The function of CRM in countries like India is to allow the service providers to offer automatic maintenance processes and employ cordless handheld inspection coupled with web-based portals. This makes it easier to track the performance of various equipment, maintenance planning, controlling inventory and informing repair technicians and reporting results to the responsible authority right at the moment. This has paved the way for a rise in dependence on handheld devices for reducing the load of paperwork and improving accuracy of collecting data. Moreover, data systems and communications equip the service providers with various informative tools which can be used to assist the clients when it comes to decision making. The commercial as well as the industrial segments have led to 70 percent of effective facility management in our country. When these industries are broken down into smaller segments such as malls, hotels, corporate offices, healthcare centres and multi-tenant office buildings has been classed under the conventional stronghold of the facility management firms here. 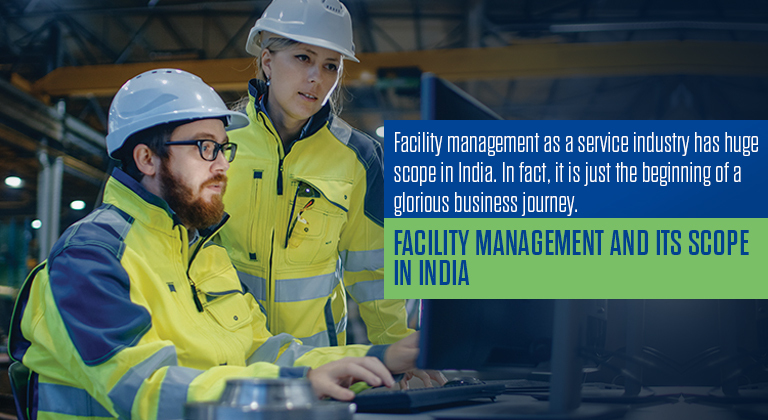 In India, the greenfield industrial activities have allowed a boost in the scope of growth for facility management. Some facility management service providers have developed various means of meeting the rigid needs of outsourcing as insisted by the multinational concerns in the different industrial units such as pharmaceuticals, food and beverage, auto ancillaries and many others. ICT or the information and communication technology sector has actively converged with the facility management services in most of the developed as well as developing nations. In matured markets, remotely monitoring one or more of geographically dispersed buildings from a central location has become quite successful. The real-time monitoring of all the systems within the building like ventilation, high voltage air conditioning, electrical equipment and security among others has paved the way for maintenance of the systems much ahead of time. Remote monitoring is useful searching and finding all kinds of issues, optimizing consumption of energy and reducing the operational costs. With the integration of ICT and improvement of energy management, the Indian facility management sector is changing its base to performance rather than depending on contracts. Companies which previously focused on offering soft services are now collaborating with concerns offering core competencies in technical areas in order to achieve outstanding abilities in those fields. The commercial sector, at present is mainly driven by IT, banking finance and BPOs and therefore, they will be able to surge the demands for various outsourcing services in the near future. This is quite evident since these industries were the most prominent movers when the facility management market started spreading its wings in our country. Facility management is expected to have a boost in the penetration levels across all sectors, particularly, manufacturing and industrial areas which showed a tendency to involve in-house facility management in the past. With a rise in the prospect of outsourcing, the manufacturing businesses are now able to pay attention to improving their core competencies in place of shouldering the burden of maintenance aspects of their business. This is definitely a promising situation of facility management in India with its accessibility increasing across all industries operating within the country.